One of my favorite recipes to make for the kids, very, very easy and I seem to always have 1 or 2 blackish bananas left over at the end of the week. 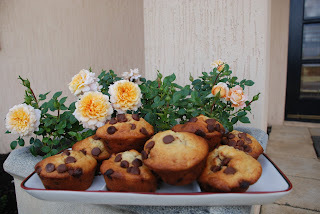 So soft, sweet and perfect to make muffins with. In a mixing bowl, mash the banana, mix with the milk, egg and melted margarine. Stir in the flour, sugar and choc bits until just combined. Spoon the mixture into well greased muffin tins. Bake in oven 190degrees Celsius or 370 degrees Fahrenheit for approx 20 minutes.